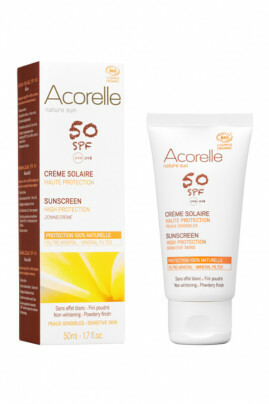 Acorelle Organic Sun Cream SPF 50 effectively protects the thin skin of your face from the UVA and UVB rays of the sun. Its high degree of protection is ideal for clear and sensitive skin that want maximum protection. Composed of titanium dioxide, it naturally reflects the sun's rays. This mineral filter is combined with the patented active ingredient Api Oléoactif with anti-oxidant properties to protect the skin from cellular aging. This natural composition is enriched with vegetable oils such as karanja and sesame oil to nourish and soothe the skin, put to the test during exposure to the sun. With no white effect, its creamy texture penetrates quickly for easy application. This sun care is water resistant for protected skin in all circumstances. Its tube format allows you to take it everywhere with you! Acorelle Organic Sun Cream SPF 50 is used both winter and summer to fight against the harmful effects of the sun. At the beach or skiing, it is part of the essential natural care to have! A sunscreen for a face protected from the UV rays of the sun! Apply the organic SPF 50 sun cream in sufficient quantity before exposing yourself to the sun. Apply again after swimming or physical activity. Repeat the application frequently to maintain good protection. We advise you to avoid exposure to the maximum hours of sunshine (between 12 P.M and 4 P.M) as well as prolonged exposures, even with suitable sun protection. Avoid contact with eyes. Not suitable for children under 3 years old. Do not expose babies and young children directly to the sun. Overexposure to the sun is a serious threat to health. Wearing a hat or covering garment is strongly recommended during the show. A face protected from the UV rays of the sun thanks to a natural composition! Dicaprylyl Carbonate, Titanium Dioxide, Aqua (Water), Coco-Caprylate, Pongamia Glabra Seed Oil *, Zea Mays (Corn) Starch *, Polyglyceryl-6 Stearate, Polyglyceryl-3 Polyricinoleate, Sorbitan Isostearate, Polyglyceryl-3 Diisostearate, Arachidyl Alcohol, Aluminum Hydroxide, Stearic Acid, Sesamum Indicum (Sesame) Seed Oil *, Rosa Damascena (Rose) Flower Water *, Aloe Barbadensis Leaf Powder *, Bisabolol, Helianthus Annuus Hybrid Oil *, Olea Europaea (Olive) Fruit Oil *, Propolis Extract * , Pollen Extract *, Citric Acid, Turmeric Longa (Tumeric) Root Extract * Behenyl Alcohol, Lauroyl Lysine, Arachidyl Glucoside, Sodium Benzoate, Polyglyceryl-6 Behenate, Sorbitan Caprylate, Potassium Sorbate.